SKU: ThermoPower-DEMO-VHP. Category: Demo Solar Hot Water Collectors. ThermoPower: Sample SunMaxx evacuated tube collector: These are perfect for distributors and installers as a way to demonstrate the collectors for customers. The best way to convince clients to use the SunMaxx solar system is to show them a hands on unit. 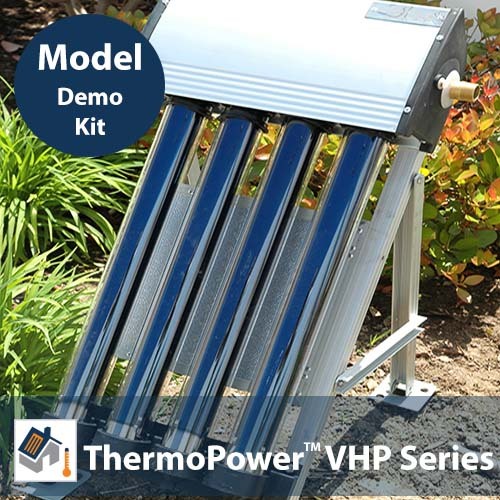 This easily portable model lets you show the system inside and out including all 4 heat pipes so your customers can see, touch, and imagine the use of solar hot water on their own roof. The collector comes with a manifold, mounting hardware, and evacuated tubes with 4 heat pipes pre-assembled for an easy hands on comparison. Great for solar education or science projects. We also have other fun Solar Educational Kits. If you have questions, need help, or simply feel uncomfortable placing your order online, feel free to contact the product representative at 1.800.786.0329.